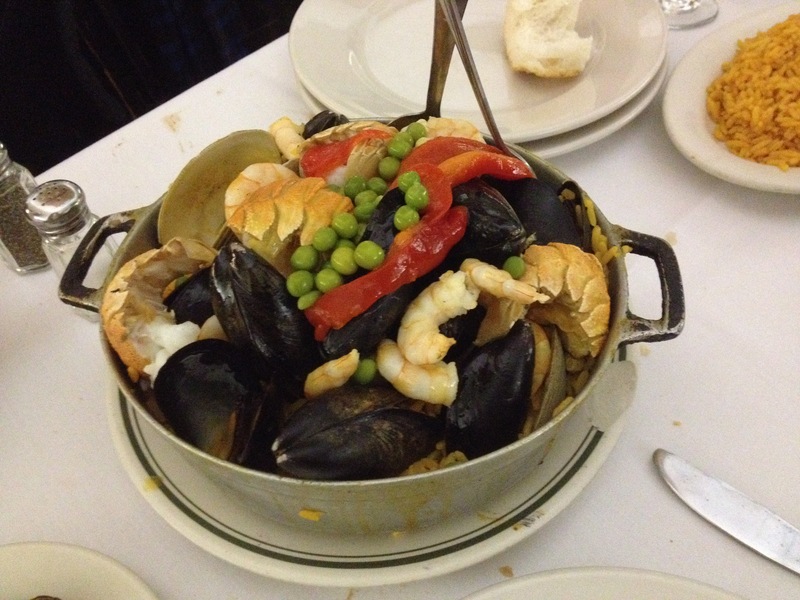 NY Eater’s eblast popped up in my email, and it opened up with pictures of paella, yummy paella: 10 Old Fashioned Spanish Restaurants to Try. The visual is the first entryway to tantalizing my tummy, and I became very hungry and passed judgment quickly by the photographs. Spain restaurant had by far the most attractive-looking photo of paella Valenciana. So allow me to be a bit shallow and judge first by appearance with my food because I try not to with people. This shallow food gal headed to 13th street, based on dish appearance alone, to meet her digestive dinner date. For all I knew, this paella could be an imposter; it could be all looks and no taste. I approached the address, and the canopy over the sidewalk made it easy to spot. A took a step down, opened the white door and was faced with a bar that looked all of its years old (since 1967). There were a few tables, but we were led to the back dining room, which had stark white paint-cracked walls with crooked paintings and prints of Spain positioned haphazardly. I was getting a mélange of granny’s basement and an old museum or back of a church hall. But I still had hope for my radiant dish of mixed seafood to brighten the room. 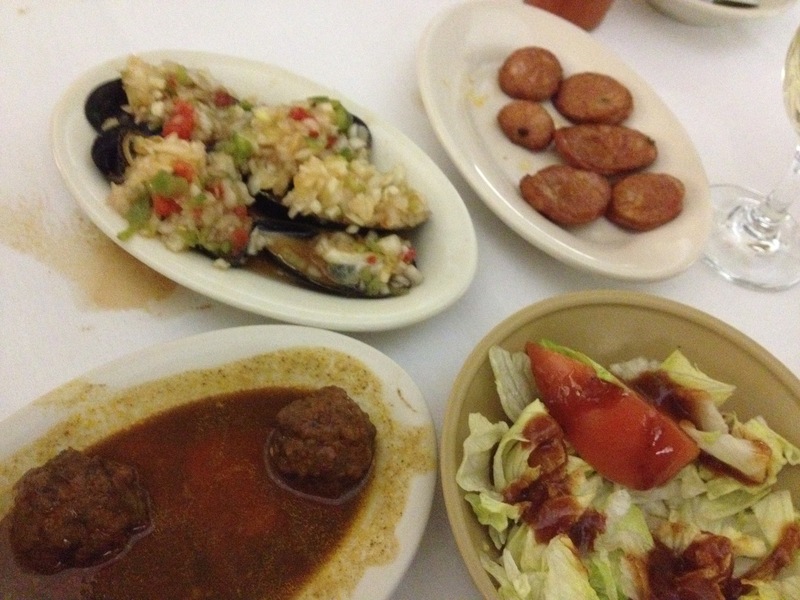 We barely sat on bench seating with worn springs underneath, when servers delivered three small plates of food: mini meatballs in a slightly spicy gravy, cold plump mussels topped with chopped onion, celery and red pepper; and sliced grilled chorizo. That was a warm welcome and helped to block out the blah room. When we were close to finished with our tasty samplings, a server came over and picked up the plate with the one chorizo piece and rambled in Spanish as if he believed he was communicating with us, all well gesturing for me to take the last piece. It brought humor to the table because I felt like I did not have the option of turning it down. As if you couldn’t tell yet, there’s nothing fancy or serious about this experience. Then the paella arrived. It was the same silver pot I saw in the profile picture mounded with shellfish. The saffron-stained rice sat beneath the shells. Like an online dating site, the photo on NY Eater was dolled up, and live, there were no lobster claws but rather small pieces of tail that looked more like langoustine. All-in-all, the seafood was cooked properly, and the rice below was moist. It was a pleasant meal, and even more enjoyable at $23.95 with plenty of leftovers. Perhaps the article I read, listing this as on of the Top 5, should be titled “old” restaurants instead of old-fashioned. Skip the cappuccino. It was hot water with a hint of coffee flavor. I expect more from a Spanish restaurant when it comes to coffee. I won’t be shouting olé, but it was an enjoyable evening. Next stop: Newark, NJ’s Iron Bound section for some “traditional” Spanish and Portuguese cuisine.